Your Grace is Sufficient: Which way is "Holier"? No one would ever imagine that the simple issue of the manner of receiving communion, whether on the tongue or in the hand, would provoke such strong reactions from individuals and groups. And yet, receiving communion has been added to a long list of hot button issues that continues to divide the Church from within. It is ironic that Holy Communion, the Sacrament of Unity par excellence, has become a counter sacrament of division that polarises the Church. Defenders of the practice of communion on the tongue, often a smaller minority, would argue that their choice of reception accords greater reverence to the Eucharist. And they have good reason to make this claim as their position is supported by a long list of testimonials from spiritual giants. For example, St Thomas Aquinas insisted that “the dispensing of Christ’s body belongs to the priest for three reasons. First, because . . . he consecrates in the person of Christ . . . Secondly, because the priest is the appointed intermediary between God and the people… Thirdly, because out of reverence toward this sacrament nothing touches it but what is consecrated…. Hence it is not lawful for anyone else to touch it, except from necessity ...” St John Paul II adds his support by teaching that “to touch the sacred species, and to distribute them with their own hands, is a privilege of the ordained.” And then there is Blessed Teresa of Calcutta who said, “Wherever I go in the whole world, the thing that makes me the saddest is watching people receive Communion in the hand.” It is no wonder that the Church “strongly urges and exhorts” us all to receive Communion in the traditional manner. Though universally encouraged by the Church, those who continue to receive communion on their tongues often find themselves not only alienated but also denied receiving communion in this fashion. A sense of persecution can often lead to aggression. It is no wonder that this articulate and learned minority, pressed into a corner, would often launch an offensive against the abuses perpetrated by members of the other camp who favour communion in the hand, whom they accuse of contributing to the loss of reverence at Mass and a lessened belief in the Real Presence. On a bit dramatic side, communion in the hand has also been blamed for the decline and fall of Catholicism, if not the end of civilisation itself. On the other side of the divide, those who argue for receiving communion in the hand is that it emphasises an active personal involvement, one of the goals of liturgical renewal. There is also evidence of ancient practice of receiving communion in the hand (e.g. St Cyril of Jerusalem). They too have launched a counter-attack that seems more ad-hominem than principled. Their critics are accused of being traditionalist retrogrades who wish to turn back the clock, dismantle the reforms of Vatican II and finally behave like modern day Pharisees who possess “holier-than-thou” demeanour in relation to fellow Catholics. 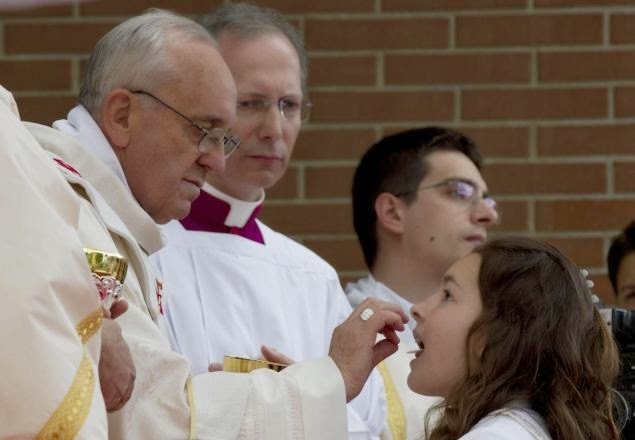 It has been quite unfortunate that receiving communion on the tongue and in the hand has often been used as stereotypes to indicate whether you belong to the post-Vatican II or pre-Vatican II camp. In actual fact, it has nothing to do with the reforms of the Second Vatican Council. The legalisation of the reception of communion in the hand first emerged in 1969. So where should we stand on this matter. It is clear that the law, in this region and in many others, allows for both communion on the tongue or in the hand. The General Instruction of the Roman Missal stipulates, “The consecrated host may be received either on the tongue or in the hand, at the discretion of each communicant. . . .” Notice that it says, “at the discretion of each communicant,” and not “at the discretion of the extraordinary minister of the Eucharist” or “at the discretion of the priest or bishop.” Having said that, it must also be added (and many may feel uncomfortable that such information should even be shared with the public), that communion on the tongue and in the hand are not on equal footing. The universal law of the Latin rite is that we receive Communion on the tongue. It is the preferred mode. To receive in the hand requires an indult or special permission that does not exist in most parts of the world (we in Malaysia and Singapore received ours in 1977). This permission to receive in the hand does not exclude the right of the faithful to receive it on the tongue. In the first condition set by the indult for the implementation of this new practice, it stipulates that “the new manner of giving communion must not be imposed in a way that would exclude the traditional practice.” Apart from the law, the Church promotes Communion on the tongue not only for its long tradition but because it “expresses the faithful’s reverence for the Eucharist and removes the danger of profanation of the sacred species” (Memorial Domini 1277). So, how can we resolve this debate without further dividing the Church? I find an observation made by Pope Emeritus Benedict XVI (formerly Cardinal Ratzinger) most helpful. Though he promoted the reception of communion on the tongue whilst kneeling in Papal masses (but never imposed it as a universal norm), he also advocated charity to be exercised by proponents of both camps. He reminds everyone that it is wrong to cast aspersions on the other party or to insist on the rightness or wrongness of these two modes of reception. Rather, we should be concerned with what is at the heart of the matter, a greater reverence in the heart, an inner submission before the mystery of God that puts himself into our hands. In his book, God is Near Us, he writes, “thus we should not forget that not only our hands are impure but also our tongue and also our heart and that we often sin more with the tongue than with the hands. God takes an enormous risk – and at the same time this is an expression of his merciful goodness – in allowing not only our hand and our tongue but even our heart to come into contact with him. We see this in the Lord’s willingness to enter into us and live with us, within us, and to become from within the heart of our life and the agent of its transformation.” In other words, the argument of the superiority of the tongue over the hand or vice versa often detracts from the central point; God’s loving condescension despite our unworthiness. The Eucharist is the gift of God to us. It is not a thing we can take or claim. Thus, the answer lies with the proper attitude matched by the appropriate gesture that would offer the greatest reverence to the reality we are about to receive. How we handle objects says a lot about how we regard them. When observing fine works of art, we do not touch them. When we hold a baby or hug a loved one, we do so gently and with care. The things we handle carefully are usually the things we hold in high esteem. When it comes to the holy Eucharist, the living sacramental presence of Jesus Christ, this should be true all the more. The sacred vessels we use, the beautiful vestments priests wear, the “Sunday best” that we adorn, the most uplifting music that we can offer all points to the depth of our love and the extent of the esteem we hold for Christ. Likewise when we receive our Lord in Holy Communion, we should receive him in the way we encounter a loved one: with reverence, care, gentleness and humility. We must avoid every attitude or action that would lead to a desecration of the sacred species. Whether we receive the Eucharist on the tongue or in the hand, we should always strive to do so with much humility and to recognise the profound mystery that it is God himself who feeds us with His own body. To be sure, the Church permits Catholics to receive the Eucharist either on the tongue or in their hands, at the discretion of the one receiving holy Communion. Both modes of receiving holy Communion have their own value and their own beauty. Debating Communion in the hand versus Communion on the tongue does raise important issues. But all too often, it has become a way, on both sides, of acting uncharitably, of judging people, alienating them and dividing the Church. In doing so, we can distract ourselves not only from the miracle what is happening in front of us, but also from the miracle that is happening alongside of us. St Augustine provides us with a timely reminder, “If we receive the Eucharist worthily, we become what we receive.” We become what we eat.